Campaigning steps up on N Yorkshire fracking plan – DRILL OR DROP? With just a fortnight left for comments on Third Energy’s fracking application in North Yorkshire, campaigning in favour and against is intensifying. Third Energy is running a drop-in session and presentation today in Kirby Misperton, the site of an existing well it wants to frack. The meeting, entitled Meet the Experts, says it will focus on public health and safety planning. The speaker is Dr Andrew Buroni from the international consultancy, RBS, which says on its website that it is “uniquely placed to support shale gas development in the UK”. Frack Free Ryedale, which opposes the planning application, said the meeting was announced less than a week ago and described it as a “hurriedly arranged” response to a meeting in Pickering in July on the health impacts of fracking. A spokesperson for Third Energy said invitations cards to 609 local households were mailed last week but the event had been planned for several months. “While hazard management and risk prevention underpins all planning and industrial operations throughout the UK, it is the case that the outputs are written for regulators and are not particularly transparent or geared to address local community concerns”. Third Energy said it believed “ongoing meaningful engagement is very important”. It said it was organising the event to share the findings of technical assessments and to enable residents to discuss their concerns. 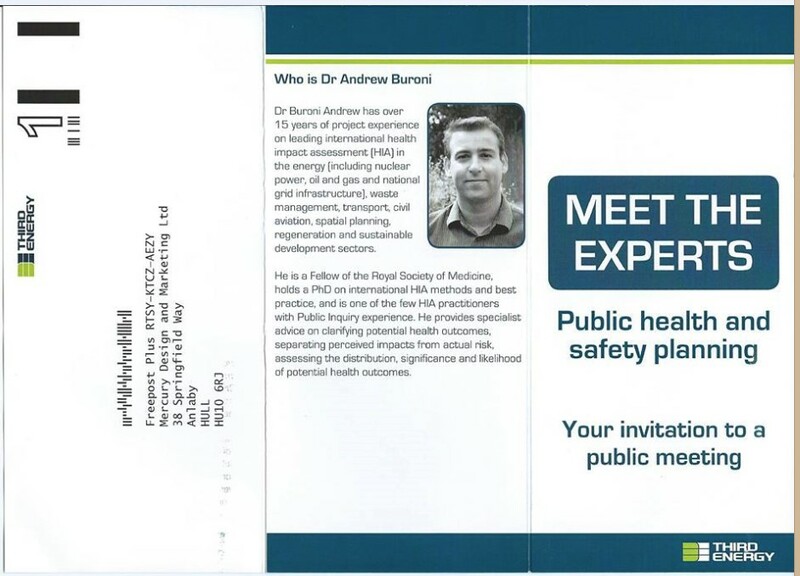 It described Dr Buroni as a public health and planning expert. He is a Fellow of the Royal Society of Medicine but is not a medical doctor. His PhD is in international health impact assessment methods and best practice. According to his LinkedIn profile he has worked on the Hinckley Point C nuclear reactor project, expansion schemes at London City, Belfast City and Birmingham International airports and waste facilities in England, Wales and Ireland. The meeting is in the village hall. The drop-in session runs from 1pm-5pm and the presentation from 6.30pm-8.30pm. Frack Free Ryedale (FFR) said the talk in Pickering in July, organised by the retired GP, Dr Tim Thornton, had attracted 450 people. The panel included Dr Patrick Saunders, a co-author of a report by the charity Medact. This said there was mounting evidence that fracking posed varied threats to public health. Two days before the final day of the consultation period, on 12th October, the local MP, Kevin Hollinrake, is hosting a meeting in Malton. This is described as a Regulators Question Time, at which people can put questions to representatives of the Department of Environment and Climate Change, Environment Agency and Health and Safety Executive. The consultation by North Yorkshire County Council on Third Energy’s application continues until Wednesday 14th October 2015. The target date for deciding the application is 18th November 2015. I hope the North Yorkshire development control committee have the courage shown by LCC DC committee and resist the bullies putting our children’s health at risk.